Broysan 4 is a macerator with high shredding and plumbing performance, it has a basket-filter with rotating blades in stainless steeel 316 and a separate pump. 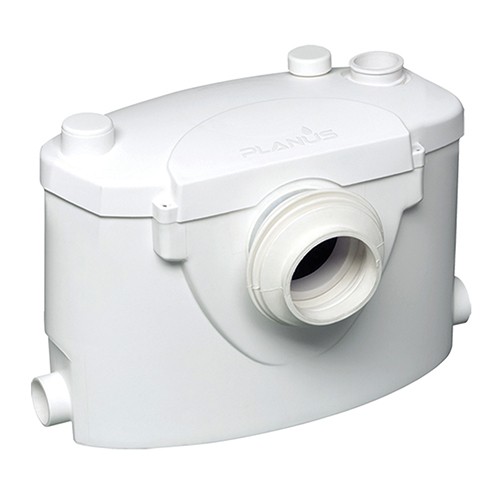 Broysan 4 is a box containing a powerful and silent macerator which allows waste water to be discharged through a narrow pipe (22/28/32/40 mm) to the nearest soil pipe.Broysan 4 allows you to create an additional bathroom away from the soil pipe without the need for major building work. It can be used in a wide variety of applications: where there is a requirement for an extra bathroom, for a basement installation, in holiday cottages, for adding facilities in hotels and guest houses, adding facilities for the elderly or the disabled or during the renovation of offices and other light commercial buildings. 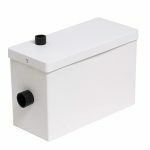 Broysan 4 can be connected to a toilet with horizontal trap. Through the additional side connections it's also possible to connect other bathroom appliances. Broysan 4 is made with grade IP-68 electrical protection for maximum electrical safety. SKU: MACE. Categories: Heating & Plumbing, Macerators, Planus Macerators, Pumps.